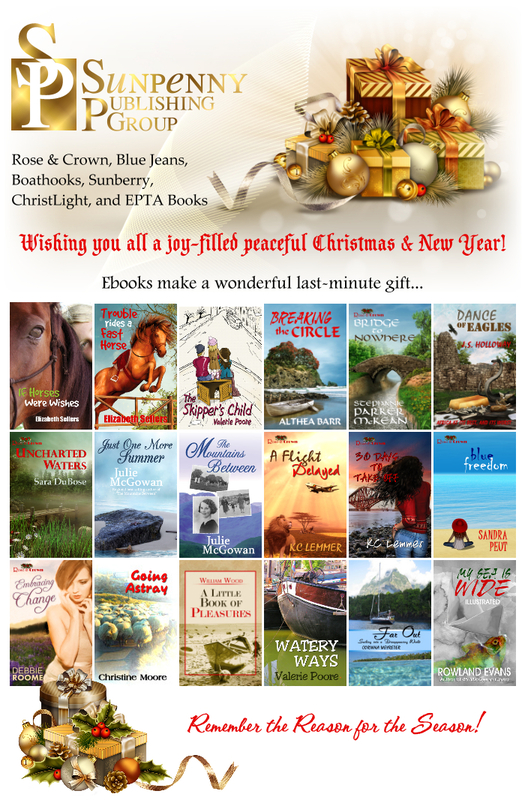 Sunpenny Publishing Group: Merry Christmas from Sunpenny! Merry Christmas from everyone at Sunpenny! We wish you a joy filled Christmas and New Year. Hi everyone! All done and ready for Christmas? No, didn't think so. I'm only just starting - and working all the while. My poor family are very long-suffering! A quick note for those of you who don't use Kindle: as of 24 December our books will be available on iPad, iPhone and other Apple devices, and will start to become available on most other formats too including Kobo, Nook, Android and others! Just when, depends on how fast their own systems register our books, but ... very soon. Which makes us very happy. Happy enough that we're going to do a massive price drop on Christmas and Boxing Days on our Kindle ebooks! Meanwhile, if you've bought a Kindle as a gift for someone, why not PRE-LOAD a book onto it for them? From children's books to romance and boating and thrillers and adventure and Christian books, there's sure to be something here to delight everyone's palate. Click on the cover images below for details, and have a fantastic holiday season, everyone!